I'm a big proponent of breastfeeding- I nursed all my kids past their first birthday, and two of them nearing their third birthday. However, I know that for some people, breastfeeding just isn't an option. For example, a friend of mine tried very hard to nurse her baby with Downs' Syndrome, but because of his low tone and a host of other issues, despite working with lactation consultants and otherwise, nursing didn't work out, and her milk dried up, and she needed to figure out the best formula to give her baby. 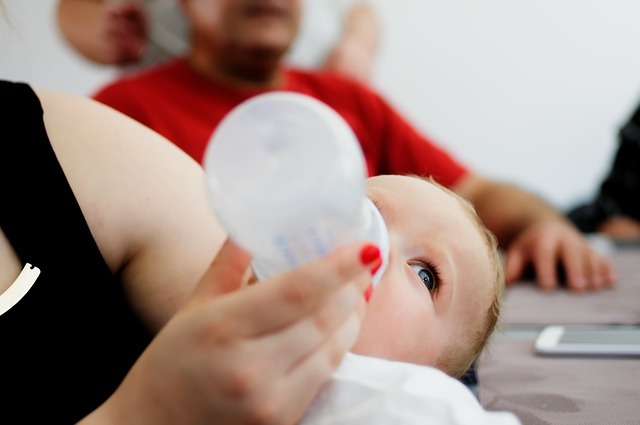 It is very important for babies' guts to get the right start, and it's good to know that organic formula has benefits that other formulas do not. This informative piece was contributed by a reader. In 2010, a study was published in “Alternative Medicine Review regarding organic foods. It determined that organic foods contain higher levels of certain nutrients such as vitamins. This is especially important during the fall and winter months. Not only are there fewer days of sunlight for Vitamin D absorption, but babies need more vitamins as they grow slower during these seasons. In that same study, it determined that organic foods contained lower levels of nitrates and pesticides compared to non-organic foods. An organic label assures you that your baby will develop fewer side effects including dysfunctions in the endocrine and immune systems as well as injury of the lungs and nervous systems. Organic baby formula is made to break down easier for your child's delicate digestive system. Without tummy troubles, your baby can have a better quality of sleep that is deeper and longer than with non-organic formula. Some organic formulas are specially made for nighttime. Hipp Good Night Milk, for example, is formulated for bedtime feedings. Hydrolyzed milk is a process in many types of formula to break down milk protein. While it makes formula easier to digest, some companies use chemicals during the process. Only organic formulas find a way to break down proteins without the use of chemicals. Organic foods build stronger immune systems because there are no foreign ingredients. When your baby has a stronger immune system, they are more resistant to allergies. Some of the ingredients in non-organic formula can actually create allergies in your child. All baby formulas contain brain-boosting fatty acids, but organic formula has more of them. Your baby will have an advantage with mental development and reaction times with more polyunsaturated fatty acids and Omega-3 fatty acids. A better environment starts from the ground up. Organic formula supports the environment in the most natural way. It starts with how the animals are fed. Genetic engineering is not a part of the organic process, so cows are not fed by GMO. There is nothing modified genetically in the plants or animals that will wind up in your baby. Your baby can have the best start possible when you choose organic baby formula. With the potential for health risks using non-organic formula, your baby will be on the right track to a safe and healthy lifestyle. Both of you can have more rest when your baby sleeps longer and deeper, plus you can reduce the worry of allergic reactions. The European Union has stronger regulations for organic foods and baby formulas, which is why we recommend those approved organic formulas.